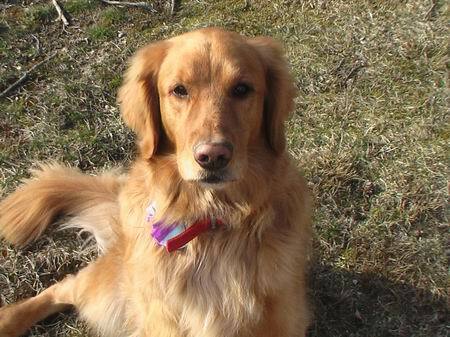 On May 24, 2002, the Norell family received a wonderful two year old male Golden from LIGRR who gracefully accepted his new name of &apos;Hampton&apos; and became part of our family. Sadly on March 13, 2007 Hampton crossed Rainbow Bridge after a sudden and devastating bout with a digestive disorder and an auto immune disease. Hampton was loved by everyone that ever met him, but in the end, no amount of medical attention or love could take his illness away. Hampton loved to play in the back yard with any kind of ball, but his favorite was an orange lacrosse ball. He did not care what the weather conditions were outside, he wanted someone to stand outside the fence and throw the ball across the yard so that he could chase it, chew it, and returning it for another toss. When he got tired of chasing the ball, he had his favorite spot along the driveway fence where he was content to lie and watch whatever was going on around him. Hampton was the happiest when family or friends would stop by to visit or pick up one of the kids. He did not care if it was a bunch of teenage girls or college bound boys, Hampton had to be in the middle of everything. In the evening he would make his way into the den to see who was available to pet him, but inevitably would wind up next to whoever was on the couch. After all, it was his couch. Never in our lives did we ever think it was possible to love (or be loved) by a &apos;dog&apos; as much as we all did over the five years that Hampton was with us. We will always remember the Golden moments and thank LIGRR for allowing us to share our lives with Hampton. During our time of need, Dr. Petermann and the staff from A&A Hospital went above and beyond with Hampton&apos;s care and Melanie (LIGRR President) provided much needed support.